I have to admit, I really had no idea what was going to actually happen at last night’s “The Beer Diva” event at the Sydney Opera House. All I know is that I was intrigued – how was this woman going to fill a room full of beer drinkers at The Studio, pair tastings with singing, multimedia, piano and live interaction, and pull it off? But pull it off she did. Beer judge Kirrily Waldhorn, that is. She kicked off with a quirky video clip about the history of beer, which somehow later devolved into humorous images of David Hasselhoff and Monty Python, and an artist’s rendition of Kiss guitarist Gene Simmons’ famed tongue to illustrate a flavour chart. Waldhorn acted as mistress of ceremonies, changing into various outfits to match her beers – from a black faux fur for dark beers to a white satiny dress for wheat and white beers – and followed a cheeky script. Intermittently, singer Leah Thomas would break out into song and Richie Henson would bang out on the Steinway piano. It was eclectic, fascinating and borderline bizarre, but through chuckle-level humour and great video production, Waldhorn kept it all entertaining. 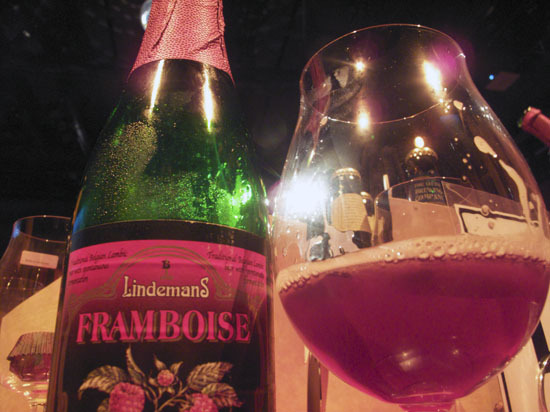 Her co-star, of course, was the beer, and bottles of various brew styles, from a the original lambic style – represented in a raspberry-flavoured Belgian Lindemans Framboise (not to be confused with the Aussie Lindemans) – to a spectrum of lager, porter, pilsener and amber ale from James Squire, and – my favourite – the Wicked Elf Witbier from Port Macquarie’s excellent Little Brewing Company. A single beer “captain” was chosen from each table via the sole bottle opener being taped under his or her seat, and responsible for pouring each taste into the supplied Spiegelau tulip glasses. Another highlight was the pairing of the porter with a Ferrero Rocher chocolate – not necessarily original, but always a great way to enjoy the beer style’s chocolaty characteristics. Another interesting component of the show was the various debunking of beer myths. Beer is bad for you; nup, dark beer has as many anti-oxidants as red wine, and can mitigate BBQ carcinogens. Beer is fattening; a pour is only 500 kilojoules, and your glass of milk is far higher. Beer is bloating; not so much if you pour it into a glass rather than sucking in all that extra CO2 via that beer bottle. Beer goggles exist – yes, yes they do, and there’s science to prove it, albeit beer is aided by lots of other factors. Another truth is that you’re not supposed to take photos at the event, as security eventually made clear after I took a number of happy snaps. Luckily I got off a few good’uns, so enjoy the sneak peak, but if you’re a fan of your brewskis, it’s worth checking out the real deal. Oh, and a last note that proved very disappointing to one of our table patrons, enamoured with a beer-swilling, comely sheila – the Beer Diva, sadly, is married. For those who want to catch The Beer Diva, she’ll be at the Opera House until May 2. Click here for details and tix. 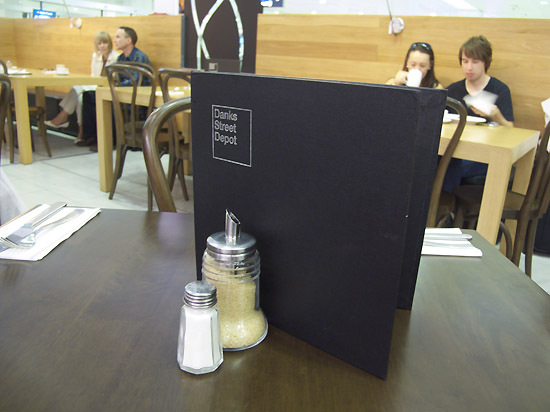 Really, there’s nothing more shithouse, more overpriced and more reliably underwhelming than airport food. I virtually never eat McDonald’s as part of my Sydney eating regimen – or, erm, at least when I’m sober – but get me to an airport and it becomes a viable, reliable option, so putrid are the other random eating spots serving food with the same zeal as a prison canteen. So while boarding my flight to Queenstown today, en route to research a travel story, the jazz diva and I checked in early enough to visit a rare breed – a real restaurant. Anyone who loves their cafes in Sydney know all about Danks Street Depot, Jared Ingersoll’s dynamic café in Waterloo that pairs skilled cooking with quality produce. It also has the best damn reuben in town – something an expat New Yorker like me can hold dear to his heart. Ingersoll isn’t in the kitchen, wherever it is as I don’t notice any pan-rattlers (admittedly, I didn’t look very hard), but I don’t expect him to be. In fact, I’m not sure what to expect, but things start off well with the staff promptly seating us to one of the walnut-stained wood tables. It’s not the easiest space in the world to make warm – sandwiched in an open-air slot between the airline check-in counters and cheesy airport shops – but whoever designed it has done an admirable job. High-backed wood “banquets” face straight-edged, long beech tables and give a physical divide between Danks St’s organic fit-out and the frigid airport ecosystem beyond. Warm-lit lamps with designer shades also add a homey counterbalance to the flouro lighting that surrounds the terminal. It’s a far cry from the real Danks St, but it’s an excellent spot in which to relax for its relative setting. For breakfast, the jazz diva and I get a latte and a bowl for a long black, then split an intriguing bacon hash with poached eggs and sourdough toast. 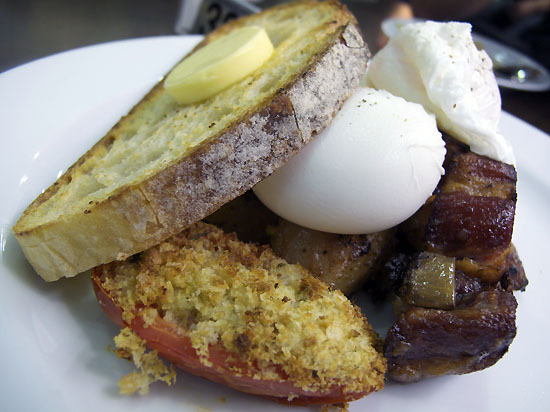 What arrives is lovely: thick-cut chunks of bacon, textbook poached eggs,, roasted potato pieces and a tomato half, topped with a breadcrumb crunch. I’m not sure what happens here at lunch, but I’ll vouch for brekkie, and the menus for both mealtimes are quite extensive. 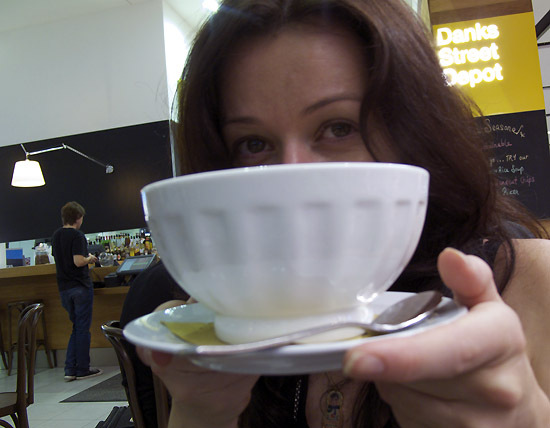 The coffee is adequate, but the crema’s a bit weak, as is the texture. And the service is a bit wobbly, and staff become downright paranoid when I start taking photos. They’re obviously not used to the same food blogging crowd who have made the Waterloo café a second office. That feels like nitpicking, though, since Danks St is a rare oasis in a flight path normally reserved for stressy check-in procedures, an unwanted onslaught of duty-free shops, and food that typically needs to take a flying leap.